The world's largest renewable energy developer, SunEdison, may be on the verge of filing for bankruptcy protection; its stock has fallen from a high of $30 per share in June last year to 36 cents today. A Wall Street Journal report this week revealed that SunEdison is being investigated for overstating its cash position. SunEdison's shares have fallen drastically since then. A SunEdison spokesperson declined comment. Today, SunEdison is $11 billion in debt, according to Reuters. By contrast, in 2014, the company, with about 7,200 employees, pulled in $2.4 billion in revenue with an operating income of $536 million. During the previous 12 months, shares of SunEdison had gained 175%, "placing it among the top performers in solar stocks," according to a MarketWatch investor bulletin at the time. In 2014, the solar and wind-power developer began an aggressive expansion. It created two yieldco subsidiaries, TerraForm Power and TerraForm Global. Yieldcos are companies that take over the operating assets of a larger company or companies in order to produce a steady stream of predictable revenue by managing long-term contracts. But yesterday, TerraForm Global announced that its 10K financial performance filing would be delayed due to SunEdison's financial reporting issues. "Due to SunEdison's liquidity difficulties, there is a substantial risk that SunEdison will soon seek bankruptcy protection. Such an action would have a material adverse effect on TerraForm Global given our reliance on SunEdison," TerraForm Global wrote in a filing with the U.S. Securities and Exchange Commission. Also on Wednesday, Brian Wuebbels, CEO of TerraForm Global and Terraform Power, abruptly resigned. Over the past two years, SunEdison has aggressively dialed up its acquisitions in order to expand its marketshare, buyouts that left it $11 billion in debt, Reuters reported. In 2014, SunEdison began buying existing wind, hydroelectric and solar power contracts. It also acquired First Wind, a Boston-based utility-scale, renewable-power developer. "They were looking to both expand their current pipeline, expand into new markets and simultaneously develop some novel technology solutions," said Tyler Ogden, analyst with Lux Research. In 2015, SunEdison announced it was buying U.K.-based Mark Group, a renewable energy installer. SunEdison also announced it would acquire three renewable energy subsidiaries and seven existing renewable energy project contracts in China, India, South Africa, Uruguay and several South American counties. "SunEdison intends to act quickly to address the opportunity in emerging markets, where the majority of future global electric power infrastructure investments will be deployed," Ahmad Chatila, CEO of SunEdison, said at the time. Last year, SunEdison also sought to buy India-based Continuum Wind Energy and Globeleq Mesoamerica Energy in Costa Rica, and it tried to acquire Utah-based rooftop panel provider Vivint Solar. "There's growth opportunities in more and more projects being added into the ownership of the yieldcos," Ogden said. "India is a good example of not only expanding their pipeline, but they were expanding their technology presence, too...looking to develop module manufacturing capacity." SunEdison's deal to acquire Vivint Solar for $2.2 billion fell apart earlier this month when Vivint terminated the agreement, citing failure by SunEdison to meet its financial obligations. SunEdison began in 1959 as a major supplier of silicon wafers, which are not only the basis for semiconductor chips but also solar cells used in photovoltaic panels. While SunEdison sold off its semiconductor subsidiary in the last year to focus on being a renewable-energy corporation, it continued to use its expertise to manufacture solar modules. Along with purchasing existing hydroelectric and solar power contracts overseas, SunEdison sought to either acquire or create new manufacturing operations in Latin America and China. The company produces fluidized bed reactors for making polysilicon wafers and crystalline silicon ingots, both crucial to the production of solar panels. "Ultimately, they transitioned into becoming a developer because it offered greater returns. It guaranteed them a revenu stream from products while still leveraging their experience as a [silicon] wafer producer," Ogden said. What went afoul was that SunEdison tried to grow too quickly -- and in too many directions. Another problem: a skyrocketing amount of debt without the ability to show investors its value. "SunEdison was doing really well a year ago until they decided that they can grow like a tech unicorn," Raj Prabhu, CEO of cleantech research firm Mercom Capital Group, said in an email reply to Computerworld. "They took on billions in debt and went on an acquisition binge on the assumption that their stock price will keep going up. Unfortunately, investors will look at solar yieldcos with skepticism after this. However, yieldcos are typically stable, conservative structures and several other companies have done them right." When SunEdison's investments didn't pay off, SunEdison began pulling back. It closed polysilicon manufacturing plants in Texas and Malaysia in the second half of 2015 and it cancelled its purchase of Mark Group and Latin American Power. "They were trying to draw back after expanding, but it was too late in the process," Ogden said. Even as SunEdison struggles under the potential of a bankcruptcy filing, the renewable power industry continues to thrive. SunEdison's financial difficulties shouldn't have a "huge impact on the solar market as a whole," Prabhu said. "We see this as an isolated incident of mismanagement and overreach by one company," he explained. Solar energy industry jobs are growing at 20 times the national average. Since the first Solar Jobs Census in 2010, solar industry employment has grown by 86%, according to the Solar Jobs Census. 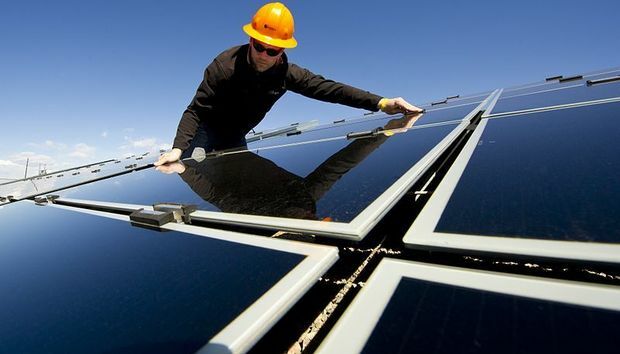 There are now more than 705,000 jobs related to the solar power industry. The cost of rooftop solar-powered electricity will be on par with prices for common coal or oil-powered generation and the technology to produce it will only get cheaper, according to Deutsche Bank. The sharp decline in solar energy costs is the result of increased economies of scale leading to cheaper photovoltaic panels, new leasing models and declining installation costs. New U.S. solar power installations this year are set to break all previous records by more than doubling what was installed last year, with 16 billion new watts of photovoltaic capacity, according to GTM Research's U.S. Solar Market Insight Report 2015 Year in Review. While the original renewable power industry was built upon public subsidies, other energy industries, such as oil, were as well, Ogden said. And, since the onset of these renewable subsidy programs, both the costs of renewable energy technology and installations have been continuously dropping. That has been reflected in a decrease in subsidies that renewable energy companies need to survive. "SunEdison is not a canary in the coal mine for the solar industry," Ogden said. "It's an example of a large developer that tried expanding way too fast in too many directions in a poorly managed way." With its stock crash, SunEdison's market cap is down to about $170 million, according to Prabhu. The company's acquisition potential will largely depend on how they emerge out of bankruptcy court (if they do file for bankruptcy) as they have huge debt load. "They have large private equity and hedge fund investors who will have a large role in how this all plays out," Prabhu said.